Congrats to Rebecca Airies on the release of her new book with Loose ID! 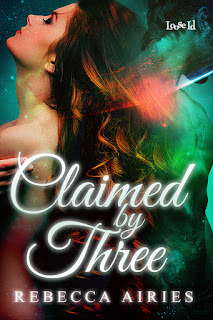 Tagline: When attacks suddenly begin after she starts dating three men, Sephanie must discover who’s behind it in order to claim her three men. Sephanie wiped down the counter as closing time approached. She looked up when the door chime sounded. She saw three men entering the store. She recognized them immediately. 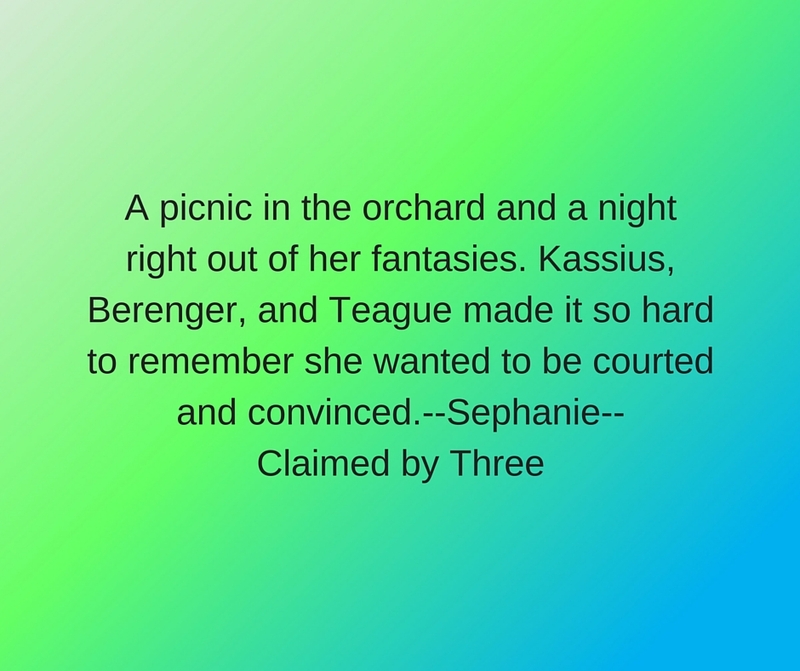 Kassius, Teague, and Berenger. Since they were here, she’d guess Kassius’s father had a talk with them. She sighed and rested her hand on the dark blue countertop. Damn, this was going to be awkward. She bit her lip and waited. They strode across the bakery. It was empty, so there was no one to overhear. She didn’t want to hear them apologize. She couldn’t stop herself from letting her gaze wander over their bodies. All three men’s gazes were locked on her. Berenger’s black hair hung around his face. He looked like he’d been more than a few days without a shave. The dark hair at his jaw was longer than normal. He’d probably been extremely busy at his skimmer repair shop. She’d noticed if he was busy, he would let his beard go a little wild. That untamed look sent a thrill through her. Muscled, strong, and in shape from hard work, he led the way over to the counter. He didn’t look happy, but he wasn’t obviously angry. “Hello, Sephanie. I think we need to talk.” Berenger placed his palms on the counter. “I doubt you do.” Kassius eased up alongside Berenger and braced an arm on the countertop. His blue eyes sparkled with some emotion she couldn’t quite read. He was solid, muscular, and strong. Berenger and Teague were also fit and brawny. Kassius’s came from hard physical work in his groves and winery. In contrast, the jut of his high cheekbones and his aquiline nose gave him a refined look. His blond hair hung past his shoulders. “I realize your father probably talked to you, but there’s no need for this.” She shook her head. She glanced at Teague when he stopped on the other side of the counter. Teague epitomized the hard training and rough life of the PD. The sharp angles of his jaw and the lean muscles of his body reminded her of a warrior ready for battle. His black hair was short, but shaggy at the moment. He’d probably been growing it out since the regulations for PD on planet were much more relaxed than while they were in space. His light brown skin gleamed and tempted her to reach out and touch him. “We didn’t like guarding you from possible danger, because you might be hurt by it. Yes, we had better things to do than sitting there keeping our distance. We wished we could take you out on dates and get closer to you, but we had to wait. We couldn’t keep our objectivity and watch over you if we became involved with you.” Teague reached over, cupped her chin, and gently turned her head until she looked at him. She swallowed hard. She wanted to believe them, maybe too much. Without a doubt, she’d had feelings for them since she’d met them. She wanted to take the chance on them. Although their appearance drew her eyes, it didn’t keep her attention. Their personalities and interactions together did that. She liked the way they backed one another up and always seemed to be there for friends and family. Sephanie came from a family with strong ties. That type of behavior was an important part of what she wanted from a relationship. 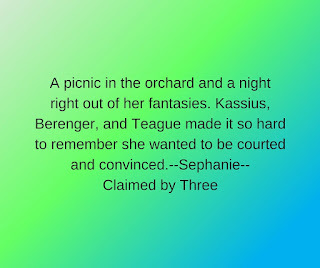 “We intend to court you, Sephanie.” Kassius stretched across the counter and clasped her hand. “You intend to court me? You don’t know me.” With a nod, she let him draw her down the counter and out from behind it. She pursed her lips to keep from smiling. She’d wanted to hear they were interested for a long time. They stood in front of her but didn’t crowd her. She appreciated that. Even though she longed for physical closeness, they had some things to clear out of the way first.